The newly released iPhone 5S that will replace the previous model in store shelves, is promised to have at least the same battery life or even better than the iPhone 5. When this new model, 5S, will be available for sale, the previous model will no longer be found in stores. Hopefully this should be a good thing as it is expected that the 5S is an improved version of the iPhone 5 which didn’t really impress the crowds. But one thing that the iPhone 5 didn’t really excel at was battery life. Actually the opinions are divided but there were definitely problems with the battery because a lot of iPhone 5 users have complained about the terrible battery life. We live in the generation of smartphones where everything is online and electronic, battery life is the thing that ensures we are connected all day and for a device such as the iPhone 5 to not last even 5 hours with a 3G connection turned on, is definitely a big disappointment. iPhone 5S battery life is supposed to be at least equal if not better than the iPhone 5 battery life. The iPhone 5S is supposed to last up to 10 hours on 3G and 250 hours in standby while the iPhone 5 was said to last 8 hours on 3G and 225 hours in standby. 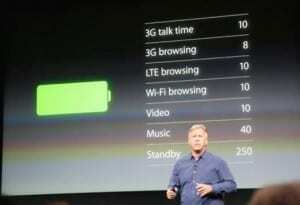 Also the iPhone 5S is said to last with 2 hours more on LTE than the previous model.